Fill out the form below and receive weekly updates on MLS listings that match your neighbourhood search criteria. You will also receive a list of recently SOLDS in your neighbourhood so that you can compare prices and be up to date on market conditions. Kevin specializes in downtown Toronto’s central western neighbourhoods. Each area offers a variety of home styles, price ranges and amenities. Get started on your home search by clicking on the featured neighbourhoods below or contact Kevin today to discuss your ideal location and home. Since the 1960's the Corso Italia neighbourhood has been recognized as the business and cultural centre of Toronto's Italian community. However over the last few years an ethnic mix has developed in the neighbourhood with Portuguese, Latin American, and Anglo-Canadians rediscovering the neighbourhood. 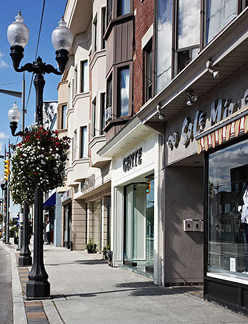 This diversity is reflected in Corso Italia's main commercial strip along St Clair Avenue west. There you will find all your traditional Italian shops, bistros, and cafes along with other local businesses that reflect the changing demographics. Most of the solid brick homes in Corso Italia were built between 1910 and 1950. There is a good mix of detached and semi-detached houses, as well as bungalows. Most of the houses boast old world characteristics like a "Cantina", which is the Italian equivalent of a cold cellar, as well as many of the backyards feature fruit and vegetable gardens. Please note that the schools listed below have very definite enrollment boundaries. Prior to buying, you should contact the school you are interested in to confirm they will accept children from the address you are considering moving to. What are your preferred neighbourhood(s)?